Coach Rick first became involved with amateur boxing at the age of 8 when he began to “hang out” at the local neighbourhood gyms in Toronto. A few years later, Rick and his family relocated to the Kitchener area and after a few close brushes with the law, Rick found himself at the Waterloo Regional Police Boxing Club under the guidance of Jerome “Hook” McComb and later Arnie Boehm. It is here that Rick would develop his two passions, coaching and policing. At the age of 18, and his boxing career over, Rick entered into the coaching stream, completing his Level 1 NCCP in 1984. Employment would see Rick move to Sarnia where he was the Assistant Coach to Silvio Fex at the Lambton St. Clair Boxing Club from 1989 to 1993. 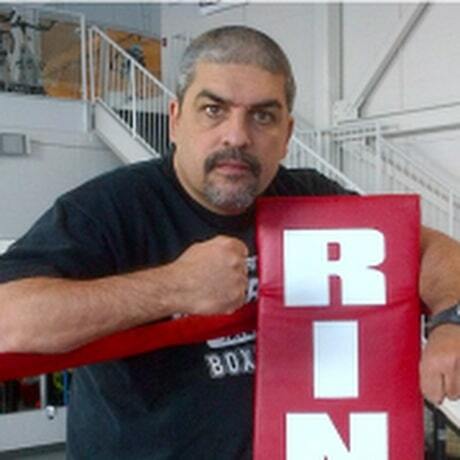 Rick returned to the Waterloo Regional Boxing Academy in 1994 and continued coaching under Arnie Boehm until his death in 2002. Arnie’s passing was very difficult on Rick so he decided to step away from the boxing club and spend more time with his own family. In 2004, with the boxing club in dire straits and very close to closing its doors, Rick was asked to come back. After a two-year hiatus, Rick returned to his “home away from home!”. Rick took on a huge task and was able to convince everyone around him that W.R.B.A. was needed in this community. Rick created new partnerships within the community and as a result the “Arnie Boehm Training Centre” was built, a state of the art training facility and the largest boxing club in the country. Today, Rick is the leader of the WRBA, the largest and most unique boxing club in the country. Rick remains true and committed to the WRBA mission statement “To promote positive and healthy lifestyles for the youth in our community” Rick has stayed true to the values and ethics of his mentors, to create well-respected, productive members of society by building self-respect and improving self-esteem. Rick is currently working on completing his Level 5 National Coaching Institute Certificate. Rick continues to promote the NCCP and is a Facilitator with the NCCP. Life is competitive! Rick’s continued contribution will help enable these young people to compete, not just in the ring……but in life.